Three students are targeted by a murderous Los Angeles gang. When was the last time you really looked at a homeless person? Spoke to one? When was the last time you read an article about their plight? Or saw information on how to help? Are they even newsworthy anymore or just part of our urban landscape, like litter and crime? These are the kinds of questions Parasites wants you to ask yourself. On a night out with friends, Marshal finds himself driving home through LA’s skid row. Before they know it, an angry mob of homeless people have decided the three students will be the next victims in their war against the status quo. This begins a cat and mouse film set in the harsh underbelly of Los Angeles. Marshal’s odyssey on those LA streets tosses him from one danger to the next, from humiliation to salvation and back again. Each leg of the journey shows us the failures of society to support those who need us the most; with one scene in which Marshal, dressed as a hobo after having his clothes taken from him (its startlingly refreshing to see a lead spend a decent amount of this film naked!) is mistaken by some yuppies as a homeless person and treated with all the nasty scorn you’d expect. 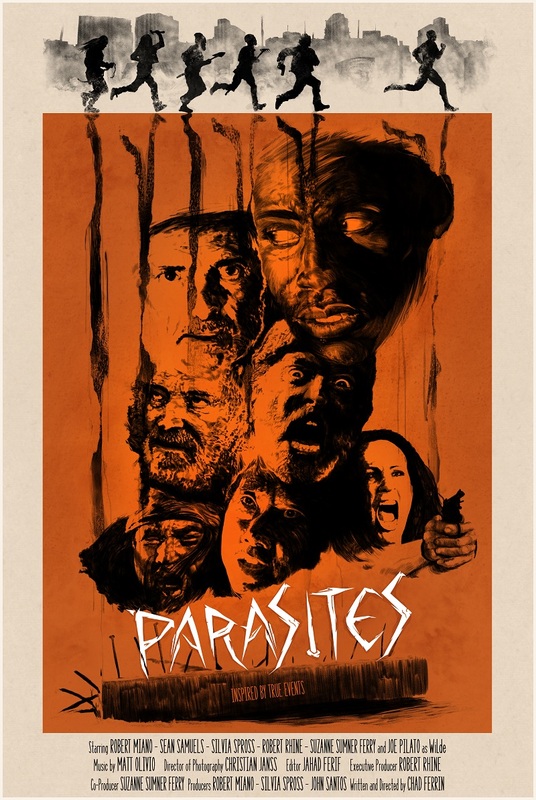 Parasites is a good looking film, with high production values, particularly for an independent film; the sets lit with natural light and seemingly almost all shot on location, which definitely adds authenticity, and the ‘80s synth soundtrack recalling Escape from New York in a way that can only favour this movie. Both action and still scenes are shot assuredly by writer/director Chad Ferrin, who obviously knows how to stretch a dollar, not to mention the hidden value of a well-staged set-piece. The script takes its responsibilities seriously, casting a hard look at our attitudes to the homeless people who have no choice but to live on our streets. They are the ‘villains’, but the film manages to not demonise them as a whole, and instead looks at the frustrations and anguish behind their extreme measures. It wisely uses tropes to support different ideas and factions within the mob; this is not a hive mind gang at all but one with several differing concerns and viewpoints, thus allowing us to see nuances within their anger. The social commentary here is vital to the backbone of the film but it’s not all education and seriousness. There is also violence galore, and some nastiness to keep the horror-heads happy. The practical effects are a little less than convincing, but the actors sell it so well it’s hard to fault it too harshly. As for the actors themselves, there is not a weak performance in the bunch, though clearly the most successful turns are by the two leads. Sean Samuels as Marshal is great as the quarterback everyman on the run, confused, and vulnerable but determined to survive. So what if some of his victories seem to come a little easier than they may have? He is never more than just one step ahead of danger and each victory is almost hollow as it only leads him to the next obstacle. Samuels gives a strong and fearless performance. Robert Miano as gang leader Wilco is commanding on screen, managing to be both magnetic and repellant at the same time – quite a feat. He embodies Wilco with complete conviction in his cause, a stop-at-nothing quality you cant help but admire, even if by the end of the film you hate him. And what an ending it is! Obvious George A Romero influences aside, it is resonant and effective in a way I hadn’t expected, its final shot heartbreaking in the fact of its possibility. The final lesson this film wants to teach. Parasites is available on VOD from January 24th.